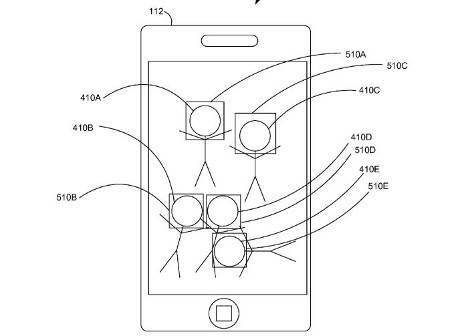 Apple’s patent application, filed in 2014 and published Thursday, describes a system for selecting contacts via facial recognition and then tagging their faces in photos. This, Apple argues, will allow iPhones to automatically find a person's contacts in an image and share the photos with those contacts. "Multiple types of communication may be available for the different people in the digital image. A user interface may be presented indicating recognized faces along with the available forms of communication for the corresponding person," Apple says in its patent application. "An indication of the total number of people available to be communicated with using each form of communication may be presented. The user may have the option to choose one or more forms of communication, causing the digital image to be sent to the recipients using the selected forms of communication." Apple envisions the photo recognition being used both for tagging and organizing shots of contacts on the phone, and integrating with social media sites to tag users in uploaded photos. This proposed Apple tech sounds very much like a facial recognition feature Facebook has been offering for years. The social networking giant first showed off its facial recognition features as early as 2011, often getting lambasted by angry customers who worry about potential privacy violations. Google has also been tied to the development of facial-recognition tools, an issue that was brought to light by privacy-conscious users when the Chocolate Factory began dabbling in augmented reality back in 2013. The Apple patent application, No. 20150227782, remains under review.